The festival celebrated all things related to local food. Farms, entrepreneurs, established businesses, restaurants, markets, services, local food resources and more. The festival was free and open to all, and I joined in the fun representing Local In Season. I met up with Jonathan Ross-Wiley (co-founder) and Lizzy Butler (fellow writer) to set up our booth and get ready to talk local food all day. I've been having a blast getting involved in the local food scene over the last year. I was always interested in local foods and locally owned businesses, but have significantly changed the way we shop and eat. We shop at the farmer's markets first and use the grocery store as our second stop. It really kicked off after I started tweeting and launched my blog. 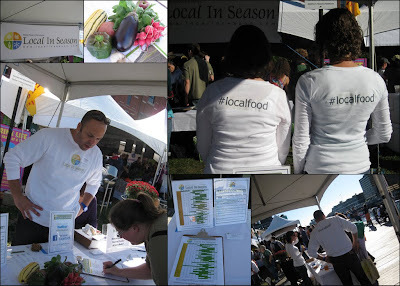 I started following local food folks and one day got a tweet from @localinseason saying, "Hi there...We are wondering whether you would have interest in being a contributing writer for us." I was so flattered and had just made a Thanksgiving feast with most of the ingredients from the farmer's market. My first 'published' article was an original recipe and celebrated a locally grown ingredients (red kuri pie). Since then I've been visiting markets, meeting farmers and vendors, and having a fantastic time! Thanks to Jon and Patrick for inviting me to be a part of the team! Now back to the festival. There was delicious local food every where you looked. From the metch at Seta's Mediterranean Foods to salted caramel ice cream at Batch Ice Cream to fresh pasta from Nella's Pasta to Pumpkin Pie soda from Maine Root Sodas. 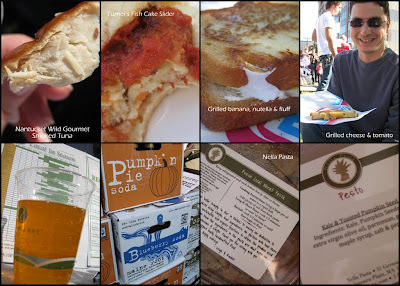 Here are a few culinary treats I sampled during the festival. There wasn't time (or stomach capacity) to try everything! But now I have a list of places to visit on my food adventures. Besides the local food, the best part of the BLFF was getting to see all of these wonderful food people in one place. From fellow food bloggers to many of the local food producers and even some of my new classmates! The crowd estimates for the day are anywhere from 30,000 to 50,000. We had a lot of those people stop by to learn about Local In Season, enter a fall recipe into our recipe contest, and sign up for the new monthly LIS newsletter. Our booth was right next to the butchering demos - which were fascinating to watch. Although one woman was not so thrilled - and decided since I was the first person she saw that she would let me know that I should be disgusted with myself for allowing such behavior to take place at the festival (guess she thought it was the Local In Season festival?). 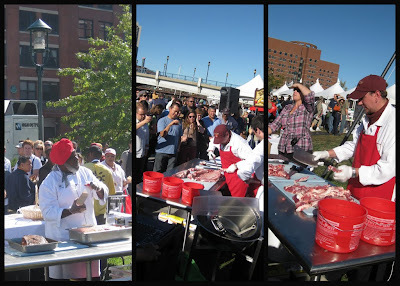 I had a good laugh and got a few pics of the Saveneur's team butchering the goat, which they auctioned off for charity. It was a truly a lovely day for local food. 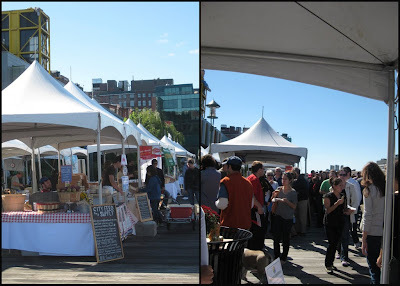 As Mayor Menino said at the festival, this new local food wave in Boston is great to see and its great to see the little entrepreneurs and little food businesses out there. Mayor Menino checking out the festival. It was great to see many of my local food friends in person. If you are looking for other great reads, be sure to visit them! I look forward to events celebrating the local food scene in all its glory. So get out there and visit your farmers market, support locally-minded restaurants and businesses, and most importantly enjoy some delicious foods! Aww! Thanks for the mention, it was fabulous to catch up with you, we need to all do it more often! Such a great event, bringing amazing awareness to all the food talent across New England. So much fun! It was so great seeing you!!! What a fantastic day... we need more of these events! You guys had SUCH a great location- and were doing an amazing job of getting the word out there! Wonderful to see you again- hope the rest of your day went well! It was great seeing you (over and over again) on Saturday! Great job with the LIS shirts too! So good seeing you as always, my foodie soul mate! Tacos soon, please? My treat! Lucky girl... you got to see everyone. I can't believe that woman went off on you about the goat butchering. Wow. I'm glad you were able to laugh it off. It was nice running into you! What to post next? Let's start with pizza.